After a thorough selection process, the Space Frontier Foundation is pleased to announce the 10 finalists for the Heinlein NewSpace Business Plan Competition. The winner will be announced at the Apollo 11 Anniversary Gala during the NewSpace 2009 Conference. “There were so many great submissions that it was extremely difficult to narrow it down to only 10 finalists,” said judge Tom Olson, managing partner of Exodus Consulting Group. In honor of their achievement, the finalists were awarded a waiver of the submission fee to have their plan reviewed by the Space Angels Network, a national group of early-stage investors focused on aerospace-related ventures. These companies will not only compete for the $5000 prize courtesy of the Heinlein Foundation, but also the opportunity to present their business plan to dedicated space investors at Space Investment Summit 7 and an invitation to Aerospace Venture Forum hosted by the Space Angels Network. To prepare for the final competition, the businesses will participate in preparatory workshops and will present their business plans at practice sessions on Saturday, July 18th. The final presentations will take place Sunday morning as part of The Business of NewSpace Day. The judges will pick the winner based on which business plan they feel is the most worth investing in. This years’ judging team will include such prestigious investors as Esther Dyson of EDventure Holdings, John Vornle of Long Term Capital, Art Dula of the Heinlein Foundation, Robert Jacobson of Desert Sky Holdings, David Livingston of the Space Show, Rex Ridenoure of Ecliptic Enterprises, Shubber Ali of the George Group, Taylor Dinerman of The Wall Street Journal, Tom Olson of Exodus Consulting Group, Guillermo Söhnlein of Space Angels Network, and Brandi Gallegos, formerly with Barclays Global Investors. To learn more about the businesses that have been selected to compete, please visit the business plan section of the NewSpace 2009 website. Registration for the conference is available at the NewSpace 2009 website, which also provides information about our group rate ($99/night) at the Domain Hotel in nearby Sunnyvale, California. 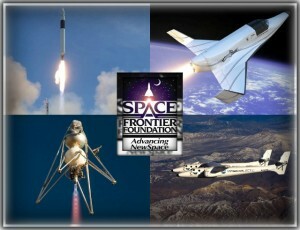 For more information about the foundation, conference, and registration, visit www.spacefrontier.org – or RSVP on Facebook today!